Consider a customized Champagne private tour with some of the best champagne tasting experiences in prestigious Champagne cellars. 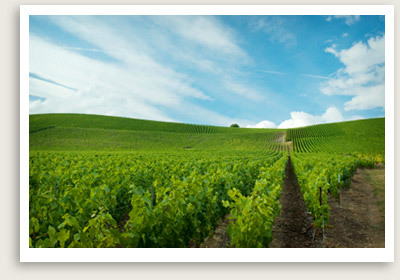 Upscale private tours in Champagne region using luxury vehicles are offered by Well Arranged Travel. Ruinart, Pommery, Veuve Clicquot, Moet et Chandon for Dom Perignon, Taittinger and more for some of the best sparkling wine. Just 90 miles northeast of Paris is the beautiful region of Champagne, France, the birthplace of sparkling wine. Champagne’s northern location, cold, rugged climate, distinctive chalky soil type and hillside vineyards, make its terroir truly original, and ideally suited for the beloved bubbly for which the region is known. The region of Champagne, France contains four main districts — each with dozens of villages, 17 of which boast vineyards classified as grand crus and 42 as premier crus. The Champagne region has been known for its wines since pre-medieval times, the earliest known grapes grown here in the 5th century by the Romans. Sparkling wine has been produced in Champagne, France since at least the 16th century, when Benedictine monks stumbled upon the process. Over a century later, an English doctor and scientist, Christopher Merret, added sugar to a finished wine to create the distinctive second fermentation now known as the Champagne method. The 17th century also yielded some enduring improvements, such as Dom Pérignon – cellar master at the Benedictine Abbey of Hautvillers – instituting the use of cork stoppers and heavy glass to help keep bottles from exploding. The rules around champagne-making are quite exacting and elaborate. Only wines produced from grapes grown in the Champagne region can call itself by the appellation d’origine contrôlée Champagne (as opposed to the generic term “sparkling wine”). The wine must also be made using secondary fermentation in the bottle, induced with a mix of yeast and rock sugar. Champagne is almost exclusively made from the white Chardonnay, or red Pinot noir or Pinot Meunier, which typically yields a white wine due to the light pressing of the grapes and absence of contact with the dark skin of the grape during fermentation. Most Champagnes are made from a blend of all three grapes, although Blanc de Blanc Champagnes are made only from Chardonnay and Blanc de noir from Pinot noir, Pinot Meunier or a mix of the two. There are a handful of other varieties permitted, though rarely used, namely Arbane, Petit Meslier, Pinot Blanc, and Pinot Gris. Other rules of Champagne wines include only blending up to three grape varieties, and a complex set of regulations around the viticulture itself, from pruning and vine spacing to pressing. More than 100 major Champagne houses and 19,000 smaller vignerons (vine-growing producers) are found in the region today. Select wines carry the cuvée de prestige name, a proprietary blended wine considered to be the top of a given producer’s offerings. These top-ranked wines typically come from Grand Cru villages. Champagne houses producing top-ranked cuvée de prestige vintages include Billecart-Salmon, Moët & Chandon, Piper Heidsieck, Gosset Celebris, Duval-Leroy, Perrier-Jouet, Boizel, Henriot, Veuve Clicquot, Delamotte, and Pierre Mignon. Non-vintage Champagnes are wines blended from several different years’ grapes. The region of Champagne, France is split into five sparkling wine producing districts: Aube, Montagne de Reims, Côte des Blancs, Côte de Sézanne, and Vallée de la Marne. Côte de Sézanne is one of the most rapidly expanding regions; it is mostly a Chardonnay region but plantings of Pinot Noir are on the rise. Aube, also known as Côte Des Bars, is an important area for Pinot Noir production, and the largest producing subregion in Champagne. Urville, Les Riceys, Avirey-Lingey, Bar-sur-Aube and Bar-sur-Seine are important villages here. Aube also claims a still wine AOC, Rosé des Riceys, used for Pinot Noir based rosé produced in Les Riceys. The Vallée de la Marne, known for wines made from the Meunier grape, runs from west of Château-Thierry to Épernay, one of the main commercial centers of Champagne. The Grand Cru Village of Aÿ and Mareuil-sur-Aÿ, the top Premier Cru Village, straddle the Vallée de la Marne and Montagne de Reims. These two villages are known for their extraordinary Pinot Noir wines. Other top vineyards in the Vallée de la Marne are Dizy, Cumières and Hautvillers. Côte des Blancs is almost exclusively a Chardonnay producing region, as its chalky soils are ideal for this varietal. Grand Cru Villages here are Avize, Chouilly, Cramant, le Mesnil-sur-Oger, Oger, and Oiry, while its Premier Cru Villages are Cuis, Vertus, Bergères-les-Vertus, Voipreux, Etréchy, Coligny and Villeneuve-Renneville Chevigny. Pierre Gimonnet et Fils and Varnier-Fanniere are a few well known and loved brands from the Côte des Blancs. The Montagne de Reims region, just south of the important historic city of Reims, is best known for black grapes like Pinot Noir, particularly in the grand cru villages of Mailly, Verzenay, Verzy, Ambonnay and Bouzy. Montagne de Reims claims more grands crus than any other district in Champagne, nine out the appellation’s 17. As with any kind of wine, the beauty of Champagne is in the preferences of the beholder – some people like them dry, some like them fruity. A trip through the Champagne region will open up a world of flavors to you, allowing you to sample a range of sparkling Champagne vintages and see what speaks to your personal palate. Well Arranged Travel conducts upscale custom and private tours in Champagne, France. Luxury private tours in Champagne with vintage sparkling wine tasting can be arranged. Let them know what you need. Inquire.